We visited the Dutch artist Birgit Stigter in her atelier close to Botanischer Garten on Sunday. Birgit is a cosmopolitan, she has moved 15 times in her life and has now arrived finally in Berlin two years ago. Throughout the years she has developed a creative process to explore exciting places and to make new international friends, in Dutch Vriendjes. Riding her bike, Birgit looks for inspiring places where famous artist live or used to live and documents them with her Hasselblad analog camera. Often she is noticed while doing this and occasionally she is even invited in; other times she talks to curious neighbors or to random people, who give her insider tips for the next interesting spot to explore. After developing the pictures at her atelier, she uses a mask to paint over the images her new friends of the day. The result is an enchanting series that juxtaposes old and new friends with magical places around the world. Bridges are another main theme of Birgit's work – Dutch and German Überbrücken. Her grandfather was a captain and ship owner and in her hometown Gorinchem she spent a lot of time right next to the bridge in the artist quarter Zaltbommel. Bridges are "in her system" ever since – "they establish connections in a literal as well as a figurative sense." 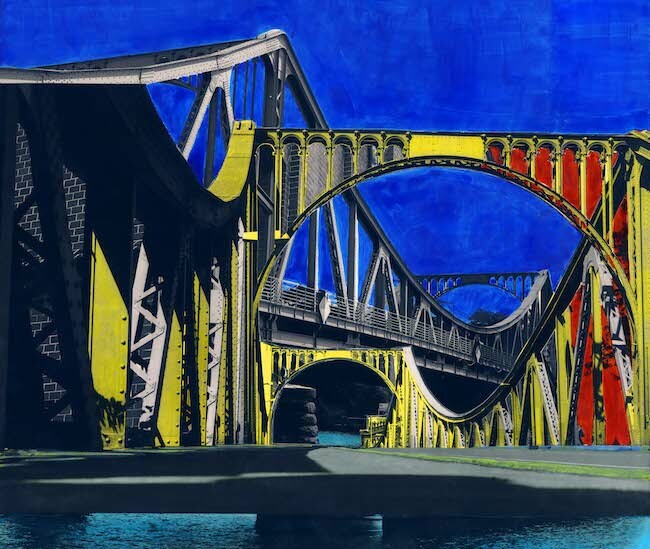 Birgit captures large steel bridges into monumental artworks like her first Berlin bridge, the historical Glienicker Brücke, where East and West German Spys were exchanged. If you want to know more or want your individual piece of art, just contact her – Birgit is always happy to make new Vriendjes. Birgit Stigter, eMail art@birgitstigter.com or call +49 176 55 23 30 48. Birgit Stigter will be invited to Mothers Finest next series of State of the Art Events.